Gesso over all of it. 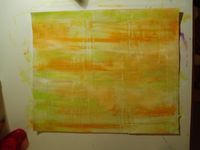 Apply distress inks over gesso and heat set. Dry brush acrylics over the ink. 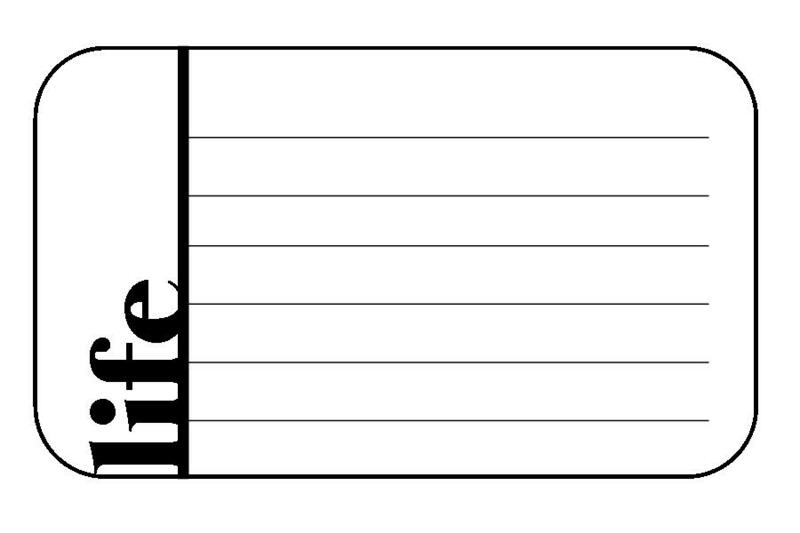 You have fabulous new paper for your layout! Now go forth and turn the ugly into the beautiful! *EDITED by Sheri* Laura had some technical difficulties so I reposted her challenge hoping to enable you guys to post your replies! So, it's my turn again!! I love reading about challenges, seeing how people can challenge themselves to do new things! Notice I said reading about new challenges.....sometimes I don't always have the time to do the challenges! This week though, I am up for it!! In fact, I am ready to get busy! The challenge is to use OFFICE SUPPLIES! I keep seeing all of those back school ads in the paper and drool over all that stuff at Target. I love the back to school time of year, especially since I am not going back to school. Office supplies can be anything from staples to notebook paper to post-it notes to highlighters and graph paper! 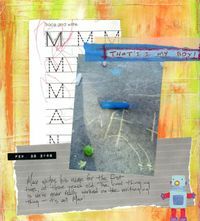 I love the way that office supplies can add some fun and texture to a page or project! Please post your challenges back to the blog. At the end of the week, I will pick a winner for a fabulous prize!!! I am back from Tahoe and didn't scrap a thing!!! Just took tons of pictures and I can't wait to print them out and get to work! Congratulations to JenR for winning the $20 gift certificate to the store! Hope you find lots of inspiration to fill up your basket! I dug up one of my old advertiding books from college and found a chapter on facing a "designer's block". This book The Design of Advertising 7th edition by Roy Paul Nelson, offered some great advice. After some preliminary work on the project, forget it for awhile. By giving your mind something else to think of( I like to play with my kids and or even run an errand) this process gives your subconscious a chance to work on the problem. Work on more than one project at a time. Moving from one acivity to another provides a change of pace that feels better than to be completely withdrawn from the creative work. There are so many different ways to get out of a slump... or in otherwords a "designer's block" and what I find useful is to search through magazine articles or online ads that spark somekind of interest. So don't worry if for some reason you layouts are not going they way you like or you just can't think of a design that flows right... leave it to the experts. Here is the online ad site... click here. Design a project (layout, ATC, whatever you please) using this ad as inspiration. 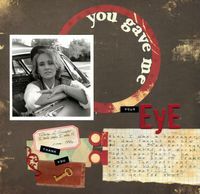 Oh and if you are still looking for some inspiration, check out the MDW class calender for Sheri's 7 Gypsies Trunk class and Lisa's Little Black Dress book scheduled for Saturday, June 12th. Ok so I am a few days late in getting this one up. Lets do a layout or something similar about yourself. 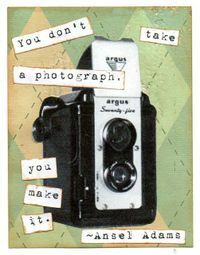 I don't think we do enough pictures of ourselves or document our lives.. only the ones around us. So, turn that camera around, stand in front of the mirror and click away. Post a link to your challenge and win a fun package of vintage goodies from The Art Life my little store within My Daughters Wish. Happy Father's Day! It's Casey from the design team, and I thought we'd honor all the dads out there this week (or grandfathers, uncles, godfathers, or anyone else who played a meaningful role in your life) and the impact they've made on our lives. The theme is "A Gift My Father Gave Me." This could be an actual object that has meaning for you, or a quality or lesson passed down to you from dad. 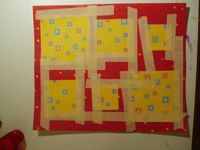 This challenge is open to any medium - you could scrap it, make a card, ATC, 4x4, or even just a written entry on your blog! 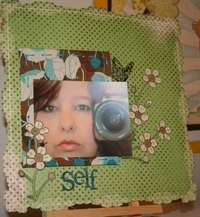 Get creative and play in any way, post your creation on your blog, gallery, picture trail, etc. and then post a link to this challenge. Leave a link to your work in the comments below by Saturday, June 21. One random, lucky player will receive a RAK page kit filled with paper and lots of fun embellishments! As an added bonus, I'll also be giving away a RAK on my personal blog in honor of Father's Day and my first challenge, so you have two chances to win! 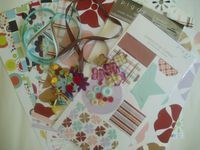 Here are a few examples to get you inspired to pick up that tape runner! Are you ready for a new challenge?? Recently I was given a bunch of pictures of me as a baby and young girl. Seriously, how many goofy pictures could one girl take?? 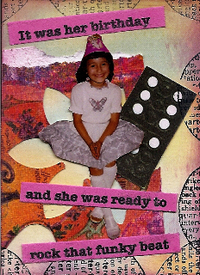 Let's just say my Mom wasn't a scrapbooker. As I looked through them I made stacks of all the real winners, like major mismatched clothing, plants and things behind my head and my personal favorite - smiles so big you could count my teeth. Anyway, I decided to pick one at random and make a funny ATÇ out of it. My challenge to you is to do the same. Here's lookin at you girls!! Look at this great album cover using the embossed acrylic painted chipboard technique by Lydia, one of talented MDW Design Team Members, her use of artisitc materials impresses me grealy... beautiful mini book Lydia! 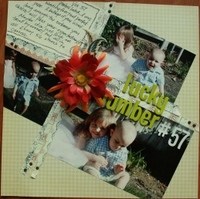 Check out Casey's take on this technique here... her work keeps me wanting to take scrapbook art to a new level. 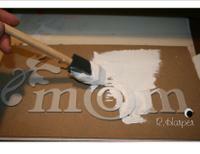 Instead of using naked chipboard, as in Rebecca's example, I used covered chipboard letters and painted them. 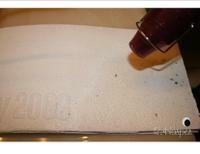 When I was embossing, I overheated the powder in an attempt to get more bubbles (I wanted that really textured look). Unfortunately, the color from the letters bled through a little. 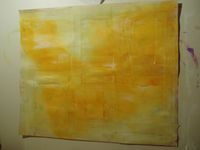 A decided to ink over the whole square with marigold distress ink, and overall, it came out pretty well. I am definitely going to play with this technique again, but with naked chipboard! 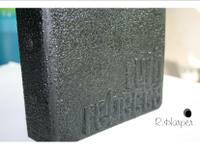 I think I have fallen in love with heat embossing again, I recently finished a mini album about me and my 29 years. This 4 x 4 maya road album is about my name... legally Ruth Rebecca (Garza, maiden name) Harper, and how I go by Ruth legally, but I am known as Rebecca or even Beckie. This album was very fun and creating the cover gave me more inspiration to heat emboss on acrylic paint. 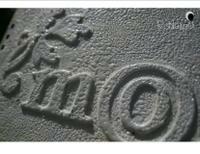 Heat emboss on chipboard covered with acrylic paint and add a commnet/link to your creation by Friday, May 16th and the MDW team will pick a winner. Adhere chipboard to desired cover and paint over completly with arcylic paint. 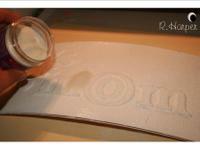 For this demostration I used a white background with clear thick embossing powder. 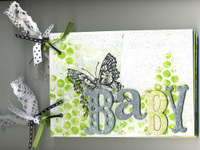 Supplies used: Basic Grey Chipboard Alphas, Fancy Pants Chipboard Flourishes, acrylic paint with a gel medium mixed in. 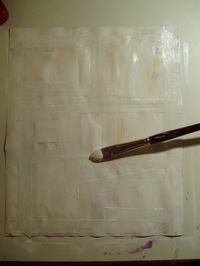 After the second layer of paint, I use a light layer of the same paint on top so that the embossing powder would stick. Watch out for small spaces between the letters and/or chipboard decorations, the powder seems to get stuck in those places. Time to heat things up... if you have a large area, I suggest to seperate the heating process into smaller sections. Here is the fron and back cover for the mini album that is still in the process of being finished for Mother's Day.I had so much fun I decided to make the front and back cover using this chipboard covered with acrylic and thick embossing powder technique. Here is a close up picture of the front cover. 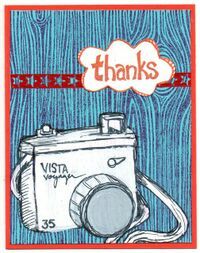 Try this MDW Challenge and post a comment/link by Friday, May 16th for your chance to win this....I had one kit left of my reusable box mini album and would love to share this with you. 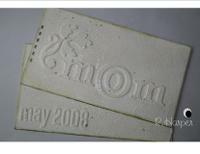 If you don't get a chance to embark on embossing this week, check out the awsome classes on Saturday, May 17th. 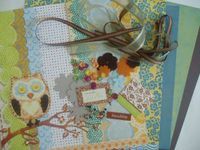 Laura has a great class on gettting that graduation mini album ready to gift or check out Lisa's paper mache dress form class that is sure to enhance your creative skills. Watch out for new and excited challenges and contests from the MDW Design Team. Casey, Daniela, Laura, Lisa, Lydia, Nanci and Rebecca will be posting every week to challenge YOU in an artistic way. Join them by leaving a link/comment to your blog for everyone to see. Check back tomorrow, May 11th for the exciting adventure. Make sure to stop by the MDW class schedule to sign-up for classes.